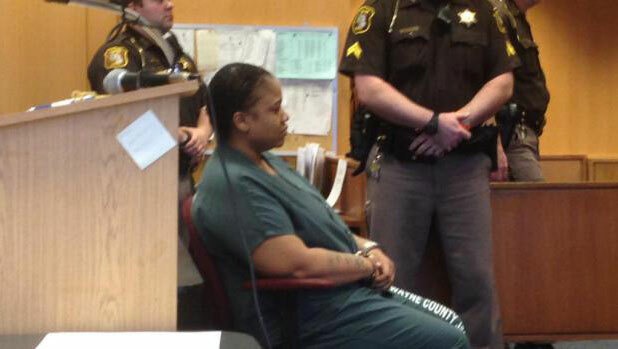 DETROIT -- A 35-year-old Detroit mother has been arraigned in the slayings of two of her children whose bodies were found in a deep freezer. Prosecutors charged Blair on Wednesday with felony murder, premeditated murder and torture. A judge entered a not guilty plea Thursday on behalf of Mitchelle Blair and granted a request from her lawyer for competency evaluations. Blair was ordered held without bond and is due back in court June 19. In court, Judge Kenneth King questioned Blair's attorney Wyatt Harris about his request for the competency review, reports CBS Detroit. "What's your basis in asking for that? Are you saying that the defendant isn't understanding this process as she stands here now?" King asked. "I believe so," Harris responded. Court officers carrying out a March 24 eviction at the family's apartment found the frozen corpses of 13-year-old Stoni Ann Blair and 9-year-old Stephen Gage Berry. Investigators believe Stephen died in August 2012 and Stoni died the following May. Blair initially was charged with child abuse, but more charges were added after autopsies revealed the siblings were beaten to death, reports the station. Blair's two surviving children, a 17-year-old girl and an 8-year-old boy, have been placed in a relative's care. The teen girl told authorities Blair made her put one of her sibling's bodies in the freezer, according to a court filing.